Orchidea from Viaggi & Sapori and Ivonne from Cream Puffs in Venice are co-hosting a one-off food event called "Dishes of Comfort" where they asked food bloggers to write about a food that brings comfort, peace, serenity to the eater. This dish could be something your mother, grandmother, or other family member made you when you were little or something you discovered after you left home. 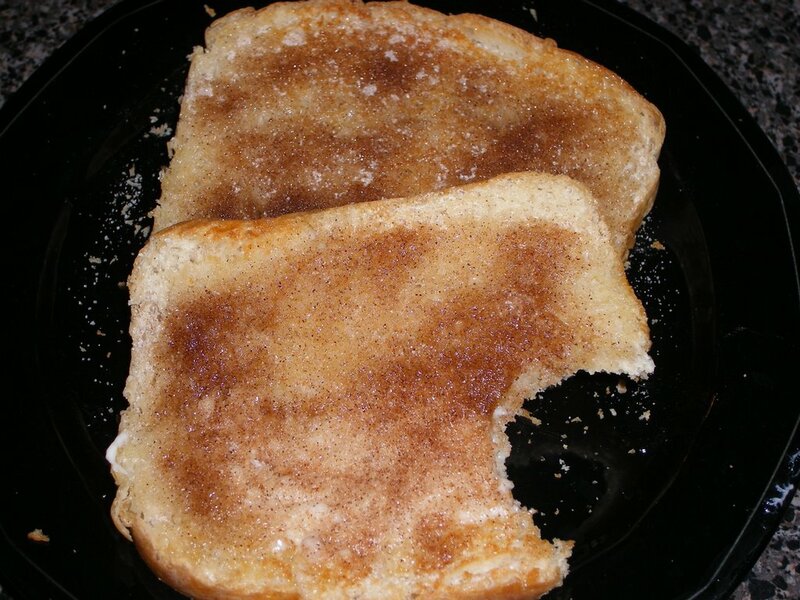 I've been wracking my brain for the past few days trying to figure out what was THE comfort food from my childhood when it struck me on my way home tonight, cinnamon and sugar toast. When I was little and sick, my mother would always make me cinnamon and sugar toast and serve it with a glass of warm Vernor's Ginger Ale. Sometimes, she would bring it to me when I was sleeping and I would wake up and there, sitting on my Raggedy Anne plate would be two lightly toasted pieces of white bread sprinkled with cinnamon and sugar, the melted butter having made a glaze of the cinnamon and sugar. When I had "mono", the only thing I even wanted to eat was cinnamon and sugar toast. Tonight, after a really long and arduous day at work, I called my mom to gripe. She answered the phone and I could tell she had a cold and wasn't feeling well. We talked for a few minutes and before I hung up, I told her I wished I lived closer to her because what she really needed was some cinnamon and sugar toast and a tall glass of warm Vernor's. Mix the sugar and cinnamon together. Lightly toast the two pieces of bread. After toasting, immediately spread 1/2 tablespoon butter on each piece of toast and place the 2 slices of toast together, butter sides together facing each other. Let the toast sit until butter is completely melted (about 1 minute). Pull the two pieces of toast apart and sprinkle generously with the cinnamon and sugar. Let sit for for 30 seconds to a minute. Enjoy with a nice cup of tea or drink of your choice. Issue ONE: Is this Cheating?